News of the company Golden Grail! 09.05.2017 Congratulates everyone on the Victory Day! The collective of the Golden Grail sincerely congratulates everyone on the Victory Day! We remember and honor the veterans and all those, thanks to whom we live and work! Low bow to you. 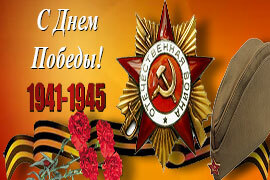 Victory Day is a great holiday, which is called a holiday with tears in our eyes. Every year the veterans of the Great Patriotic War are getting smaller, but the memory of their exploits will never be erased! Let us protect our peaceful sky and surround with care and attention of glorious veterans! Our duty is to convey the memory of those terrible days of the war to future generation, so that this does not happen again. Let the symbols of the Great Victory fill our hearts with joy and pride for the heroes of the war that have defended our Motherland. 08.03.2017 Dear women, Congratulations on the 8th of March! 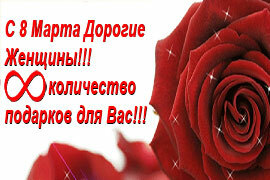 Dear women, Congratulations on the 8th of March! March 8 is the most quivering holiday of the year! After all, on this day, all men pick the most gentle and affectionate words about their beloved and dear women. But do you know what women say? It's not just words that are important, but also deeds! So that your half appreciated your words, the best way to back them up with a gift. The staff of the Golden Grail company has prepared a selection of unusual and original gifts for your lovely lovely and beloved ladies! Hurry up so that on this beautiful day as many enthusiastic and grateful words sounded! 23.02.2017 Order a gift for the Day of the Defender of the Fatherland! The defense of the Motherland is not an obligation and certainly not an obligation. Protection of the dear loved ones is the truth that each of us absorbs from the birth with the mother's milk. Appreciate the dignity of those who without hesitation and looking back are ready to stand up for the protection of these values. We have prepared for you a selection of wonderful gifts and souvenirs to one of the most important holidays in the year - the Day of the Defender of the Fatherland! On the eve of this soulful, proud and respectful holiday, we offer you original gifts filled with love and warmth of a real Russian soul. We promise that your surprise will be appreciated! 14.02.2017 Pick up a present for Valentine's Day! Love of all ages is submissive, and therefore the team of the online gift shop "Golden Grail" hastens to remind everyone that one of the most wonderful holidays in the year is approaching - Valentine's Day. On the eve of this soulful, filled with love and happiness of the day, we offer you special gifts breathing love and warmth of this handmade work, and we promise that your surprise will be unique undoubtedly! 15.12.2016 Get 15% discount on products from the "New Year and Christmas" group! Dear customers! The most long-awaited and merry holiday in the year is approaching, which children and adults are eagerly awaiting in all corners of the world. Like everyone else, we are very much looking forward to the New Year and hope very much that it will bring us further prosperity, new ideas and plans, new customers and new friends. And of course, new orders from regular favorite customers! On holidays it is customary to give gifts. Of course, we have prepared something for you. 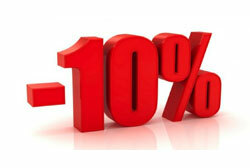 From December 15th to December 31st we will give all discounts! Use the promotional code "New Year" when placing an order and receive a 15% discount on products from the "New Year and Christmas" category! 01.11.2016 Extraordinary Christmas toys and souvenirs for the most important holiday of the year! The tradition of celebrating the New Year and giving presents is one of the most enjoyable in European and Russian culture. New Year tree and gifts are rejoiced by everyone, from small children, to serious scientists and respectable businessmen. The Internet shop of souvenirs and gifts "Golden Grail" offers you the most unusual and sincere New Year's souvenirs made by the hands of Russian folk craftsmen, masters of folk art crafts. Fill your holiday with warmth! 05.10.2016 A bright discount on colorful souvenirs! Autumn come to the city. This year, a beautiful golden time does not rejoice us of warm days. After a hot summer, it's especially sad to look out the window at the gray rainy weekdays and cold, overcast days off. But our customers do not cry together with the weather. They create a cozy autumn around themselves, coloring the interiors of their friends and relatives with bright colors of the Zhostovo painting and sparkling crystals of the products of the Faberge jewelery house. Register on our website until 01.11.2016, use your coupon code "stock ended" when placing an order. 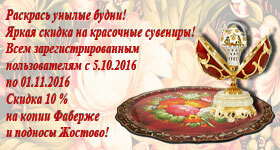 Color your autumn together with the online store of souvenirs and gifts "Golden Grail". 23.08.2016 The Golden Grail meets the golden autumn! Register from August 23 to 31 and get an 8% discount on your first order! The hot summer season is coming to an end, the days are getting shorter, and the nights are colder. In a few days the children will step into the next academic year under the cheerful trill of a school bell. Autumn is coming! Golden Grail sees off the summer without sadness, because ahead of your favorite golden time! In these last summer days, we together with you prepare for the fall meeting and give all new customers an 8% discount on the entire range of our products! Meet the golden autumn with the Golden Grail! From August 23 to August 31, 2016, 8% discount for all new customers! Until August 20, 2016, there is an action - a 10% discount on the entire range of the company. You must register and use this "stock ended" coupon before August 20, 2016. Copy this phrase and enter it in the "activate coupon" field on the order registration page. 28.06.2016 Restyling the site design www.goldengrail.ru and developing new functionality for both retail and wholesale customers. 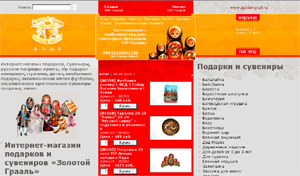 The team of designers has developed a new attractive design of the company's website. Our shop has found a second life, has become more convenient to use, more light and bright in design. Now any buyer, both wholesale and retail, can easily navigate in the rubricator, get acquainted with examples of our exclusive works and will be able to form your order through your personal cabinet. The product card has expanded to several images for each item of the product and customers can view the potential goods from all sides. New payment methods have been added of ordering for the convenience. We are waiting for you in our new world of Golden Grail gifts! 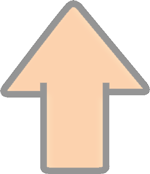 25.06.2016 Programmers upgraded the architecture of the 1C database to provide a more convenient use of the resources of the virtual store in the future. Our programmers carried out a large amount of work to upgrade the 1C database. Updated the architecture of most directories, which gives a more convenient representation of the customer about the goods and services offered on the pages of our virtual store. Modules of calculation of cost of delivery, offers of the accompanying and similar goods are improved. In the functional were introduced a variety of filters. With the help of them you can easily pick up a gift for a certain holiday, event or according to the price range. The option of adding a wrapping paper and a postcard with your text is also included. For exclusive orders, a "matryoshka's designer" was added, which will create a model of his future matryoshka with a unique individual design. At the moment, work is under way to improve the processes of providing a system of discounts and bonuses. For the years of existence of our virtual store we have established ourselves as an experienced, reliable partner, an executive seller and as a store with a wide range of souvenirs for our customers. This allowed us to conclude partnership agreements with the largest producers of souvenirs in Russia. The range of our store includes hundreds of types of goods with the symbolism of Moscow and the cult places of the capital in the widest range of prices. This allowed us to increase the size of wholesale supplies for dozens of points of sale of our large customers. 16.11.2005 The well-known magazine "SECRET OF THE FIRM" writes about the company "GOLDEN GRAIL"
About the company "GOLDEN GRAIL "wrote the famous magazine "THE SECRET OF FIRM". "KGB on exports or a thousand national trivia"
The well-known magazine "SECRET OF THE FIRM" writes about the company "GOLDEN GRAIL". 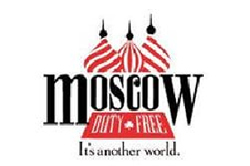 "KGB for export or Thousand national trifles"
Thanks to cooperation with the company-participant of duty-free trade zone, we were able to present our goods at the largest airports in Moscow. Thus, we were able to expand our trading network and become one of the most sought after suppliers of high quality souvenirs at low prices from the manufacturer. Undoubtedly, this influenced the expansion and increase in the quantity of the delivered goods and we reached a new level of turnover. Very popular was the use of portrait matryoshkas for individual orders. And not by chance! 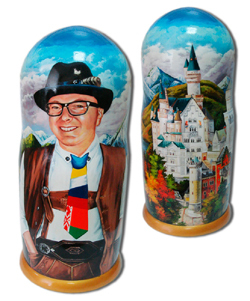 This souvenir is considered to be unique due to its personal design, originality and hand-painted technique. Not every artist is able to make a person's face on a three-dimensional surface and turn it into a work of art. But our professional artists are able to perform a portrait matryoshka of any complexity. We all love to receive gifts, but it's nice to realize that the gift was made especially for you! Do you want to surprise a foreign partner? Give him a matryoshka with his face and he will not remain indifferent. When the demand for souvenir products increased, we decided to create our own factory for the production and development of unique Russian souvenirs. Now we are able to create new samples, perform exclusive retail and wholesale orders for the production of matryoshkas, souvenir pencils, pens, magnets on wooden basis and painted in hand. Modern equipment and technologies will allow us to expand the range of unique quality souvenirs, execute exclusive orders of any complexity. Not every artist is able to reproduce the image on a cylindrical wooden blank of a matryoshkas or a figured keychain. Our artists are unique professionals in their field. They are able to follow exactly the layout, the wishes of customers and offer the design developed by them for each customer individually. In connection with the increase in wholesale and retail exclusive orders, we continue to recruit high-class masters in our staff. Russia is a country of unique traditions and customs. It is from there that any Russian souvenir takes its roots, which enthralls any foreigner. But, even if you do not have the opportunity to visit our country, you can always order a memorable souvenir in the Golden Grail shop for yourself and your loved ones. That's why we created an English version of the site, which is now available abroad. Thus, we will be able to reach a new level of sales, expand the client base by entering the export market and deliver our goods promptly through international post office services to foreign customers. It's fast, convenient and reliable! 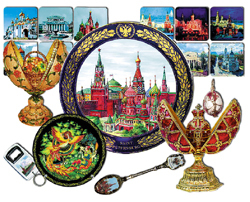 Russian souvenirs to anywhere in the world - it is available to all customers of our online store. Ladies and gentlemen! We are proud to present you the page of our online store Golden Grail! Now it's even easier to give gifts! You can pick up a souvenir for the upcoming event, without leaving your home. Convenient functionality of our site will help you find the right group of products, learn about the price, dimensions, appearance of the product, find out about its condition in the warehouse and place an order. Constantly updated assortment will never be lost in your sight - every time you open the main page of our site, you will see the latest and up-to-date news and popular products. You can also ask any interesting questions by e-mail specified in the contacts section. We are always in touch and ready to help you in choosing a gift for the most demanding taste! November 27, 2001 was an important event for us. Now we have become a full competitor in the sales market and are ready to make a statement. We do not count on glory and laurels, we set ourselves the goal of finding an individual approach to each client and providing him with a wide range of quality goods and services at the lowest prices. We are a team of experienced specialists who have major contacts in the market of souvenir suppliers and operational delivery service. We will help you to choose a gift for every taste, occasion and budget!